Qigong: Move that stagnant qi! – Glass Half Full with Leslie Krongold, Ed.D. Qigong: Move that stagnant qi! Nicole teaches medical qigong in Alameda. You’ll be learning about the ancient practice of Qigong in this podcast episode. Paul Robison – licensed acupuncture practitioner – explains qigong as a longevity exercise. 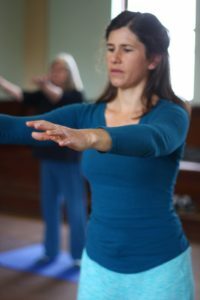 Barbara finds her qigong practice helpful with symptoms from chronic fatigue syndrome and fibromyalgia. And Nicole Stone, my qigong teacher, brings a background of dance, yoga, and meditation to her medical qigong practice. For additional information check out the National Qigong Association.